New Orleans Saints quarterback Drew Brees should win the NFL's Most Valuable Player award, according to former team-mate Tracy Porter. 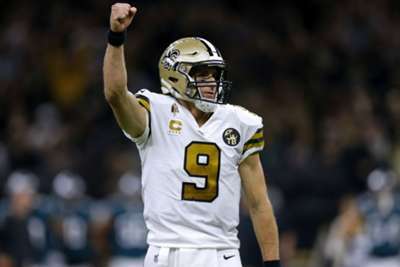 Brees is enjoying another outstanding season at the age of 39, leading the Saints to a 10-2 record in a year in which he has thrown for 3,262 yards and 30 touchdowns with just three interceptions. He also became the NFL's all-time leader in passing yards in a win over the Washington Redskins in October. And former cornerback Porter, who was part of the team Brees guided to victory in Super Bowl XLIV, believes this should be the year in which his MVP drought finally ends. "I definitely think he should be the frontrunner for the MVP," Porter told Omnisport. "Being in that region, it kind of gets overlooked a bit, I don't know maybe it's because of the smaller market that New Orleans is in but you can't overlook the body of work that he's put in. "Here you have a guy throughout the season, we're in Week 13 but he only has two or three interceptions, he has 25-plus touchdowns, with a 10-2 record, how can you overlook a guy like that? I think he should be the MVP." Brees' main rival for the prize would appear to be Patrick Mahomes, who has excelled in his first season as the starting quarterback for the Kansas City Chiefs. The Chiefs are also 10-2 on the season, Mahomes' improvisational skills and flair for the spectacular elevating a team that has continually faltered in the playoffs in recent years. "He has a huge arm, he's accurate, he has his team on a roll as well," Porter said of Mahomes. "He means a lot to his team, that's what makes it difficult, that's a good thing when you have two tremendous guys such as those two. "It's not just me being biased, I look at everything from a football level, I look at it as Drew Brees has been doing this consistently for a very long time, especially this season what he's been doing with the team, I just think Drew Brees has a slight edge over Patrick." Porter sees similarities between this Saints team and the victorious one he was a part of, saying of their Super Bowl chances: "They have the potential, this sort of has the same instances of the year when we went. "The 10-game winning streak that they had, the year we went we had the 13-game winning streak, we lost our last three, they're 10-2 right now so they're really hot as of late, they have a really good defense and we had a good really defense. "At this point in the year it's a matter of who's going to be consistent and continue that hot streak because you can be hot all year long and you can lose that flame and get put out in the first round. If you can continue it as we did, like the Saints can continue it, then I think it's very likely they will end up in Atlanta in the Super Bowl. "If I had to say what two teams would end up in Atlanta, I would look to say the Saints against the Chiefs."